I recommend backing up the files from within /Application Support > Taskpaper > Configurations before proceeding in case you want to revert to the default settings at a later date. Thanks Jesse Grosjean for TaskPaper 3. Daniel - could you please give me a hint what the contexts @ol and @ul stand for in your excellent setup? That would be “ordered list” (1,2,3,…) and “unordered list” (hyphens). I could not figure out a single filter with a difference for the use of @ol and @ul. I am assuming that there are tasks that are sequential and others in which the order they are accomplished is irrelevant. For example. Good question, sorry for late reply! I use them at the project level (project = list of tasks). It helps me remember if the tasks listed under a project are to be completed in order or not so that I don’t have to ask myself that question later. I don’t use them to “filter” by contexts. I use them as visual a “helper” contexts during review or when I take actions. 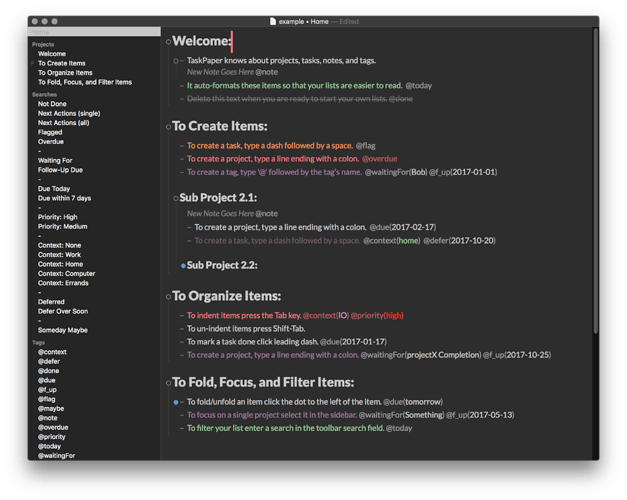 It may not be GTD compliant but it really helps me, especially when I have lots of projects to go through and/or review. The most valuable argument to use these contexts is that… It works for me. Your setup helps me a lot in streamlining the way I use taskpaper - thanks so much for all the work you put into it and making it available for the community here! Speaking of ordered vs. unorderen projects/tasks and OmniFocus-like searches: Here is a hint, which makes it possible to mimic the OmniFocus behaviour for sequential and parallel projects. Hope someone will find it useful. I had forgotten about that already. It is a really good search. I will add it to my Quiver’s notebook. Would it be possible to do one more edit to your example and add parenthesis? I find that people really struggle to understand complex queries if they are missing them. Thank you for the example and the reminder! Would it be possible to do one more edit to your example and add parenthesis? I find that people really struggle to understand complex queries if they are missing them. Of course you can further improve this search to meet your specific needs. I have a question: Why are all of the searches set to @type = project? That never returns anything for me. If I edit your searches to change that to @type = task I seem to get meaningful results. I say “seem to” because I am confused by a bunch of your other syntax (for example, your use of \ confuses the hell out of me, and I can’t find it in the docs at all), but this is the one thing I’m pretty sure is breaking every single search for me. I have a question: Why are all of the searches set to @type = project? That never returns anything for me. I say “seem to” because I am confused by a bunch of your other syntax (for example, your use of \ confuses the hell out of me, and I can’t find it in the docs at all), but this is the one thing I’m pretty sure is breaking every single search for me. Generally / can be thought of as a filesystem path divider. Look in the search documentation for the “Item Paths” section, and then for “Steps” each of which is separated with a /. Right, I get that. But all of the searches are for things like not @done which apply to tasks and not projects. Right. My issue is with \, not /. Which is not mentioned at all in the search syntax reference but I finally happened to dig up here that backslashes are used to escape parenthesis in some way that doesn’t seem to be documented outside that one forum post. Now, that would only hide all the elements and their children if they are tagged with @private, but it would also hide those projects or tags, or notes, that only have children that are tagged with @private. Just write that part of the query somewhere and use it as you need it. If you never use it, then no worries; but if you use it often, then you start to figure out things little by little. You can ask about queries and people are usually very friendly and tend to help. Right. My issue is with , not /. Which is not mentioned at all in the search syntax reference but I finally happened to dig up here that backslashes are used to escape parenthesis in some way that doesn’t seem to be documented outside that one forum post. 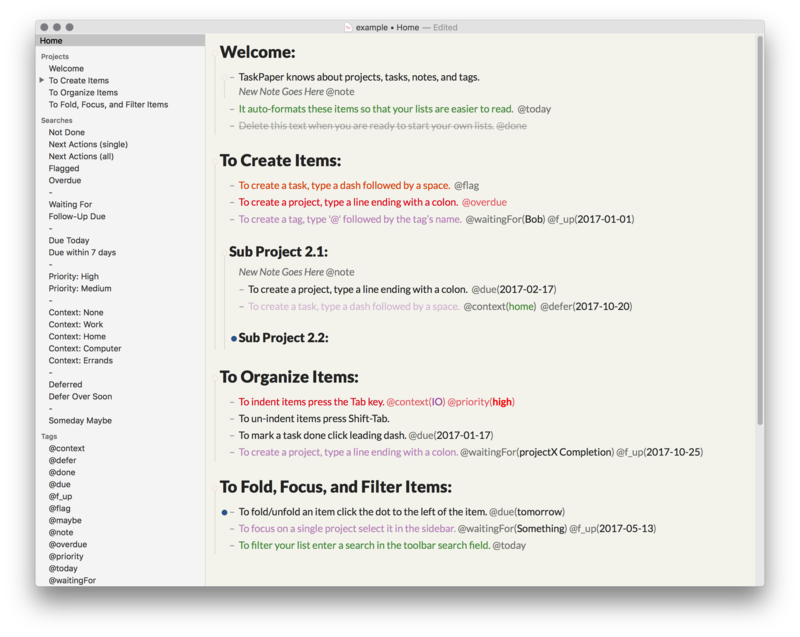 It was an element of the early iterations of TaskPaper. At one point there was no way to save searches in your documents, and when that was added, it was necessary to escape the parenthesis as you manually entered your query in the document. Now it is not necessary to know that since the newer versions of TaskPaper do the escaping automatically when you use TaskPaper to create and edit your searches or queries. AHA! That’s the missing piece for that one. So, you’re saying I could delete all of the \ from these searches and it would be functionally equivalent on a modern version of taskpaper? AHA! That’s the missing piece for that one. So, you’re saying I could delete all of the \ from your searches and it would be functionally equivalent on a modern version of taskpaper? It is not necessary to escape all the parenthesis if you use TaskPaper and the easy search editor included in it; but since the beauty of TaskPaper is that you have files that are agnostic, your actual search will include those escapes in the file (the search editor will add those for you!). So what I am trying to say is that it is recommended for you to use the options within TaskPaper to edit and create new searches. So… yeah. You don’t have to escape every parenthesis if you are using TaskPaper to create, or edit your searches. But if you go with another editor or you go to the actual code within TaskPaper; and you want to modify the queries, you will have to escape those there! Hope this helps. Somehow the bold seems kind of aggressive, but that is far from the tone. I just want to make sure you get that distinction. I am still not sure if I was clear or not. Play around with the file and if you still don’t understand, post another question. No. Leave those alone. Hahaha. They are there for the parser. Just learn to ignore them and try to use the sidebar instead since it is more convenient and easier to understand. The search editor there will translate everything hiding those escapes automatically or adding them for you. You will never see them unless you look at the actual search on the source. I had been working under the assumption that I was getting no results from either because it was trying to return a Project that was also a Task. From what I’m understanding in this conversation, this search actually means “return the results but also return the project name that each result falls under”. If that is true, I still don’t understand why “All Metadata and Tasks” returns nothing, and “All Tasks” returns only every task in my inbox project, and not any other task at all. And, no other search included in the example searches returns anything at all.